One of the most important innovations in the modern technology of dentistry is the advent of CBCT or 3D Imaging or 3D CT or 3D imaging or dental CAT (Computer-Aided Tomography) scan. 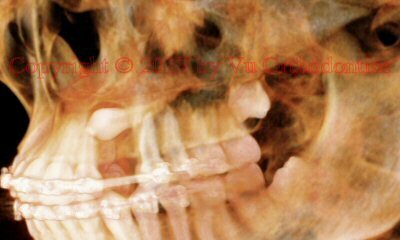 The CBCT data should be given in the .dcm format or DICOM (Digital Imaging and Communications in Medicine). It is the standard format for medical images and information. 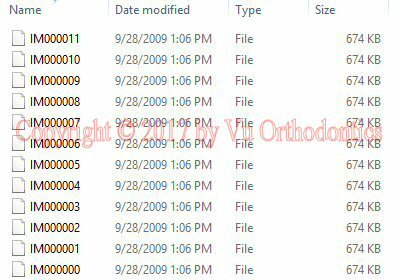 The reason is that DICOM is a non-proprietary format that can be read by any applicable software, regardless of the proprietary hardware and software used in capturing the image. 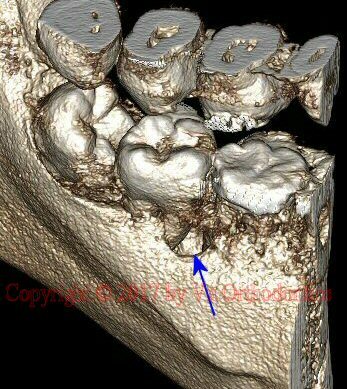 Some people have difficulty in obtaining the .dcm data from the facilities that take the CBCT scans. Unfortunately, some personnel at these facilities do not know how to export the scan data in the .dcm format. The following example shows good DICOM data (Fig. 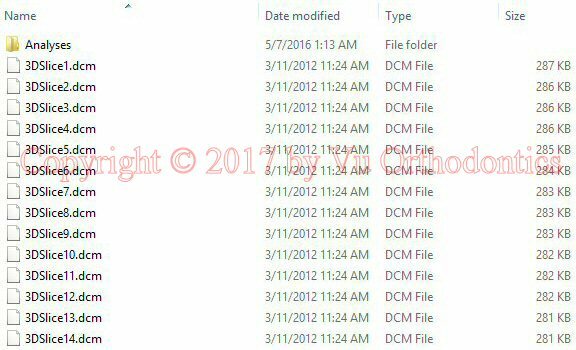 1, with .dcm extension) and bad DICOM data (Fig.2, without .dcm extension). Many CBCT machines (e.g., i-CAT) can take 3D volumes and "static" panoramic radiograph, but only a few CBCT machines can also take a static lateral cephalometric radiograph. This feature is especially useful to orthodontists. Note that the word "static" denotes 2D radiograph - as opposed to a 2D image reconstructed from a 3D volume. With this wonderful 3D "x-rays" machine, we are able to see things that have never been seen before. With the ability to see all the hard tissues within the head in three dimensions (3D), the diagnosis of orthodontic cases is more precise and the corresponding treatment is more efficient. CBCT is a technology that is considered by some to be the standard of care where 3D imaging is necessary in dentistry such as dental implant placement. This technological leap allows practitioners to gain immediate access to accurate 3D images of anatomical structures, which often are critical to precise diagnoses, and more effective treatment planning. As CBCT is adopted by more practitioners, it will continue to provide numerous benefits for practitioners and patients, including improved outcomes; reduced need for exploratory procedures; improved treatment predictability; reduced morbidity; and potentially lowered cost and time savings. CBCT technology offers certain benefits, and it can be used safely for the maximum benefit of patients. Dosimetry is defined as the monitoring and calculation of the radiation doses in safeguarding human health. A Dental CAT scan has very low radiation compared to a medical CAT scan because the former utilizes cone beam whereas the latter uses fan beam. Technological advances in digital imaging systems have significantly increased the level of detailed clinical information available to oral health practitioners while reducing the level of radiation exposure to patient. Any use of ionizing radiation should only be used when and where it is indicated. Patients should always be informed of the potential risks, benefits and alternatives. The ALARA (As-Low-as-Reasonably-Achievable) Principle dictates that every precaution should be taken to minimize radiation exposure. While oral health professionals have long relied on 2D imaging for diagnosis and treatment planning, this technology typically requires multiple exposures and, with them, multiple doses of radiation. With a properly prescribed 3D scan, practitioners have gained the ability to collect much more data, often with a single scan and potentially with a lower effective patient dose. The National Council on Radiation Protection and Measurements (NCRP) announced the publication of NCRP Report No. 145, Radiation Protection in Dentistry. This report provides radiation protection guidance for the use of x rays in dental practice, including advice on shielding design for dental x-ray facilities. (It supersedes NCRP Report No. 35, Dental X-Ray Protection.) Table 1 highlights useful information. NCRP Report No. 145 concludes: "Thus, dental radiation is a minor contributor to total population burden. However, appropriate measures are necessary to maintain dental radiation exposures ALARA." The radiation dose of a panoramic is equal to 2 days of background radiation. 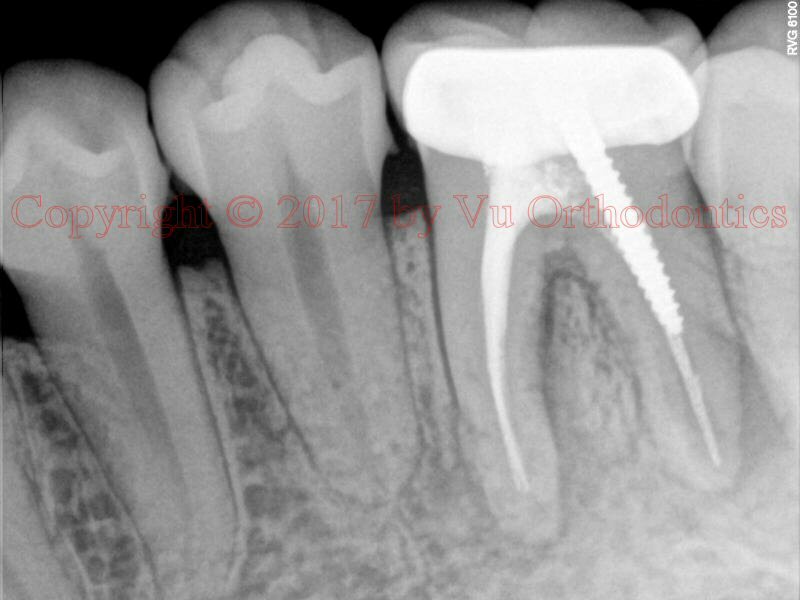 Depending on which study, a panoramic dose can be estimated as 2 or 3 times of a periapical or bitewing radiograph. The radiation dose of a 10x5 cm CBCT (mx) is approximately equal to 1.5 times of a panoramic radiation. The radiation dose of a 17x13.5 cm CBCT (full head) is approximately equal to 10 times of a panoramic radiation. The information provided here only serves as a guide, because exact comparison or calculation is impossible. A panoramic radiograph can be produced such that the radiation dose is even smaller than a periapical radiograph. If the purpose is only to check for root parallelism, the parameters can be reduced to minimal such that the image obtained only shows the shadow of the roots -- good enough to see whether the roots are parallel. By doing this, the radiation dose of a panoramic is even lower than a periapical. One of the most important steps in placing dental implant is checking to see if the pilot drill is in the perfect location and orientation -- in 3D -- in relation with the alveolar ridge and the adjacent teeth. The checking is with a guide pin (or parallel pin). Checking with a panoramic radiograph is inadequate because it does not show the buccal-lingual relation. 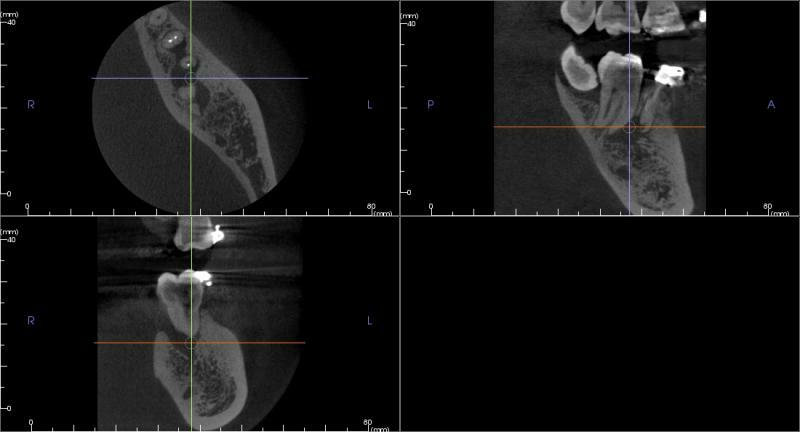 It would be best to use a CBCT with the parameters reduced to minimal values so that a volume can be obtained, which is good enough to see the shadow of the parallel pin and its relation with the adjacent teeth in 3D. The dose for this CBCT volume would be comparable to that of a standard periapical. This may be considered as a novel approach. Using standard parameters on a CBCT would be a poor choice because it would expose the patient to a higher dose for an unneccessary higher quality. There is no need to see the image in high quality if the purpose is only for checking. It is not for diagnosis.